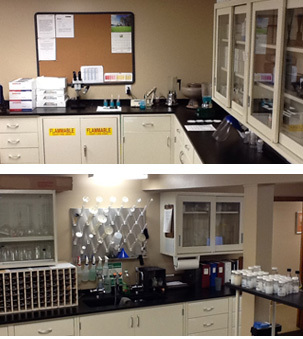 analytical lab will meet your needs for quality and timeliness. Lubricant comparison and recommendation based on customer needs. Acculube is expert in simulating machine operating conditions, allowing its laboratory technicians to offer the highest performing products for a given application. Qualification of potential new products to customer standards or Acculube's demanding requirements. Testing of incoming products and product components - we test for viscosity, water content, concentration, pH, additives levels, contaminants, and more across the Acculube product line. Spectrographic Oil Analysis, Particle Quantification, Particle Count, ferrography and other techniques to quantify component wear. Data interpretation, trend-lining and predictive maintenance planning - our goal is to help you eliminate unscheduled downtime by flagging trends before they become emergencies. completed by the Acculube Lab Team. A customer wanted continuous visual monitoring of liquid levels in a tank used to store high performance hydraulic oil. Because the oil and the tank were the same color, this was problematical. The customer asked the Acculube Lab to determine the effect on the hydraulic tanks of dyeing the hydraulic oil blue. The mission was to qualify 4 potential products and to perform a detailed competitive analysis of each. Acculube's customer needed to identify the composition of metallic flakes in ISO 150 hydraulic oil and determine their source. The Acculube test identified the source of the contamination, which led to replacement of a bronze component in their hydraulic system.